Hi I’m Richard Robinson. I’ve been a professional painter since 2001. My claim to fame is only that I’m making a living as an artist and doing pretty well – something which I hear is not so easy to do, and I guess it does take a lot of work, but it’s work that I love doing. I’ve been teaching painting nearly as long as I’ve been learning, and I enjoy helping other’s along the path as much as I enjoy learning from other artists. I started out in graphic design which is why I enjoy combining my talents in making these video lessons and putting them on the web. So far over 100,000 people around the world have seen my videos, which I think is pretty cool, and I get to meet a lot of them too which is even better. Visit Richard’s instructional Website here for more great lessons like the one below. Highly Recommended Resource From Richard Robinson! 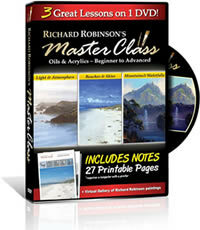 These notes and the video lesson are Copyright © 2010 Richard Robinson. All Rights Reserved. You can use either oils or acrylics in this lesson, though with acrylics I recommend mixing and using one color family at a time due to the faster drying time. Retarding Medium to slow the drying of your paints. Water spray bottle for keeping your paints wet. I recommend using ‘Atelier Interactive Acrylic’ which is most similar to oil paint. Learn more at the yellow web link below. 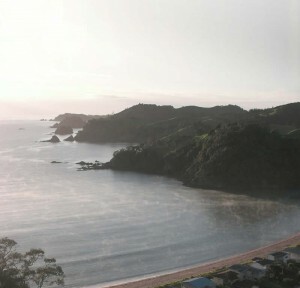 Welcome to Teal Bay, Northland, New Zealand! My name is Richard Robinson. I’m going to take you through a lesson about atmospheric perspective. Here’s the perfect place to do it. Let’s get started. It’s very easy to be inspired to paint in a place like this, but to express any place well, we need to have some basic painting knowledge. 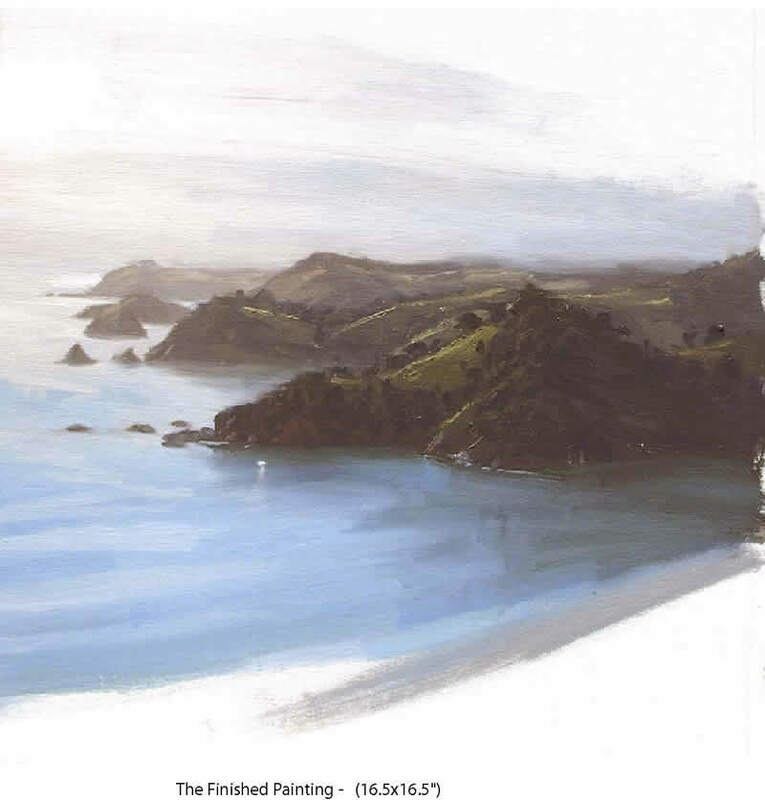 This lesson covers a crucial part of landscape painting and one which is often misunderstood. I’m often asked, how do you make those hills seem so far away, and how do you make your painting look so soft, like it’s got light in it? Well, here’s the key, understanding atmospheric perspective. Let’s get into it. As things get further away from you in daylight they seem to become more like the color of the sky, getting lighter and less distinct from each other. For instance, far away hills seem to look blue, when we know they’re actually covered with green grass and trees. White light from the sun, containing all the colors of the spectrum, bounces off objects around us and travels to our eyes through an atmosphere of air, water vapour and dust. Our atmosphere filters out some of the yellow and red colors of that spectrum like a sieve, leaving more blue and purple colors. As there is more atmosphere between your eyes and a distant hill than between your eyes and a close hill, the light from the distant hill looks bluer, and illuminated atmospheric particles make the hill appear lighter as well. I find it easier to imagine dozens of veils of atmosphere filing away into the distance, tinting and lightening the landscape behind it. Imagine these veils equally spaced on a railway track to the horizon. See how there appear to be more and more veils closer to the horizon? That means we’re looking through much more atmosphere in the distance than in the fore or midground, making things right on the horizon nearly disappear altogether. When standing at sea level the horizon appears about 5 km (3 miles) away. It’s good to keep in mind this increasing nature of atmospheric perspective. If we were to give it a name it could be the ‘atmospheric density gradient’. It’s important to note where the sun is in your scene and to notice how the light changes in the atmosphere as you turn your gaze slowly away from the sun and around behind you. Note too when looking towards the sun like this the atmospheric color gets lighter and warmer the closer it is to the sun -this means everything gets lighter and warmer the closer it gets to the sun -hills, water, clouds, birds… everything. A technique which I use all the time to make it easier to see the major colors, values and shapes, is blurred vision. I do this by going very slightly cross-eyed -throwing my eyes out of focus and reducing the scene before me to it’s bare essentials. I find this essential for understanding a scene for a painting. Don’t do this when looking at your painting though -sure it makes it look better but you can’t ask everyone else to look at your paintings cross eyed. Being able to judge value relationships is a key skill for any good painter. 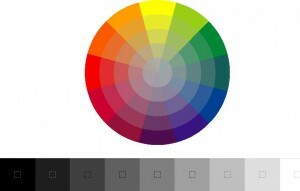 A color’s value is how light or dark it is, as if it were turned into a black and white photograph. It’s amazing how easily your eyes can fool you into believing something is lighter or darker than it actually is. A handy thing to have is a value chart which looks like this and is included in your lesson notes. It’s a great way to train yourself to see values better. Unfortunately photography has it’s limitations and in this example the lights are lighter than they really were and the darks are darker -tending to look more dramatic, but losing the subtleties of the actual scene. That’s why painting on site is so much better for your understanding of light. You can see though how at first this front hill’s shadowed side looks almost black, but using the cutout value scale reveals it is closer to the second value on the scale. Print out the value chart below and cut the middle holes out or buy one at your local art supply store. To Print this image: Click the the thumbnail below. It will then open up in another window with a larger version. Use the print command in your browser to print. Like most of painting, this is a skill that can be learned and is much easier than it first appears. All we have to do is approach the problem systematically and methodically. Now we understand basically what is happening -receding objects take on more and more of the atmospheric color. We just apply that concept to our color mixing. If we have a midground object like a hill which repeats in the distance, all we have to do is mix the colors for the first hill, then add to these colors some of the atmospheric color to achieve the colors of the distant hill. We then take this new set of colors and add more atmospheric color, making the colors for the next most distance hill, and so on for the next. A simple palette avoids confusion and encourages color harmony. I’m using Ultramarine Blue, Cadmium Red Medium, Cadmium Orange, Cadmium Yellow Medium and Titanium White. First I mix a big pile of atmospheric color. This is the colorof the sky justabove the horizon.I’ve used mainly white, with a bit of blue and a touch of red. Note the difference between the color in the photograph and the color I’m actually seeing. Now I’ll mix all the colors for the first hill.This is the darkest shadow color between the trees where no light penetrates.With this first set of colors I need to make a lot more than I actually need because I’ll be taking from these piles to make the next set of colors.While I’m mixing I’m holding up my value scale to the scene and checking that the tone is correct. This color here is the shadow color of the trees. Now I don’t want it there so I just scoop it up and move it down.This next color is the highlight color of the trees where the sun is hitting the tops of them. As I mix new colors I’m checking these against the previous color on my palette to make sure the relative tone and color is correct too. Next is the shadow color of the grass. After that is the highlight color of the grass. I’m only using two tones for each object -a shadow color and a highlight color. Back in the studio where I have more time to do a larger painting from this outdoor sketch I’d probably use 3 or 4 tones; shadow, reflected light, local color and highlight. But the light changes so fast outdoors you’d be doing pretty well to mix and paint all those colors. These last two colors are the shadow and highlight colors for the rock at the base of the hill. Now all I have to do is use these colors, adding atmosphere color, to make the colors for my next hill… and so on.The only tricky part now is just making sure that the relative tones are correct. For example the highlight color of the grass has to be slightly lighter than the shadow color of the grass. Sometimes you can start straight in with the painting, but the illusion of distance in this painting really requires getting the placement and relative size of these hills just right. I always put in my horizon line first as my point of reference and then work from there. The really important things in this scene are the distances between the bases of the hills and also the distances between the tops of the hills and the horizon. So now I’ve got my colors ready and my drawing sorted I can get into the painting without having to stop and remix colors so much. I’m just going to lay down a little bit of atmospheric color first for reference and so that my distant hills will fade into this a bit when I paint those. I’m mixing a new pile of atmospheric color which is lighter and warmer than the first due to being closer to the sun. The medium I’m using to mix with my paints in my little pots down there is Archival Classic Medium which has a drying time of about 24hrs and is really good for painting outdoors. It’s from Chroma in Australia. My paints are all from them as well. Now, I lay in my darkest values first, followed by the next lightest and then the next. Always paint a bit further than you have to so that the next layer of paint will work back into it, creating a smooth transition and covering the canvas. I’m using a big brush to speed things up, plus I had 16 cups of coffee -no just kidding. See in the photo how the hills get a bit lighter and warmer towards the sun? Well that’s what I’m doing here, adding a bit of orange and warm atmosphere color to the hill color on the left, and I’ll need to do that to all my colors as they get closer to the sun. So now I’ve put the two dark shadow color on it’s time to put on the light colors on top of the trees, which I put on a bit thicker. Again, adding a bit more orange and warm atmosphere color as it gets closer to the sun. Here I’m just dipping my brush in the medium and wiping it off with a rag to clean it and get it ready for the next color. The next color is the shadow color for the grass and I’m just going to paint that into the paint I’ve already got there, and in between the trees. 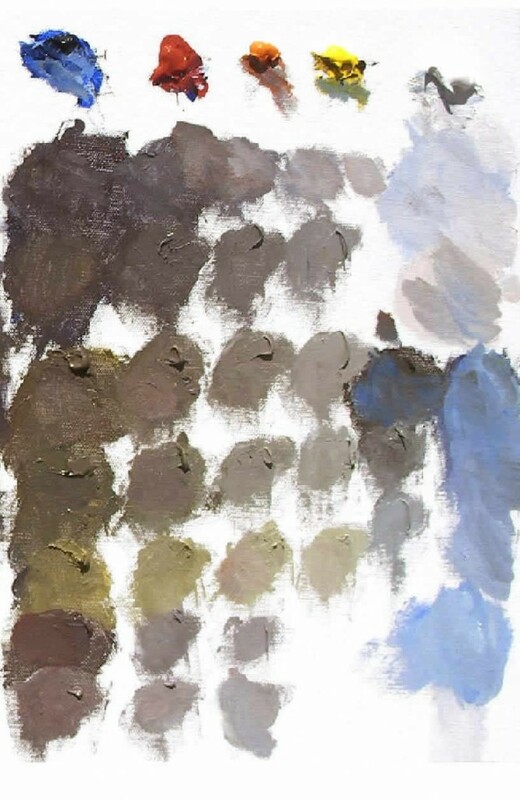 I put the lightest colors on thicker still, creating a thick ridge of paint on my brush by pushing it into the paint pile, then dragging it lightly off onto the canvas, not squashing it into the canvas. I’m not really interested in capturing every minute detail in a scene -I figure that’s what we’ve got cameras for. To me it’s more about capturing the essence of a place. Now I’m painting back some of the trees that were wiped out by the grass. Here I’m mixing a tiny bit of the atmosphere color into the tree color to make a sky-shine color for the shadow of the trees which is where the sky is reflected on the top of the shadowed trees. That just adds a little bit more three dimensionality to it. Now I’m starting work on the second hill. When I’m painting this in I’m also redefining the ridge line of the hill in front of it. But I will go back in afterwards and paint some of those foreground trees back in. Again, adding orange and warm atmosphere color into the colors that are getting closer to the sun…and this gets more pronounced as we travel further back into that atmosphere color. Putting on these light colors is really the most exciting part of the painting for me. It’s like you’ve done the groundwork and set the scene just waiting for these final brushstrokes to make sense of the whole thing. Like smoothing the pillow for the crown jewels to sit on. Here’s where I paint back in some of the trees on the ridge line that were lost when we painted in the second hill. You can really see here how I’m pushing the paintbrush into that pile of paint to get a thick glob of paint on the end, that I can just lay down quite softly on top of the trees. Another thing to observe is that atmosphere brings the values closer and closer together as things get further away from you. Also, you need to remember that it’s not just atmospheric perspective that’s making this object seem further away, it’s also linear perspective, which means getting your drawing right, and making things smaller as the recede -making thinner brushstrokes and smaller trees. So I’m finished with the hills, now I’m going to mix up the colors for the water and put that in. Again, the photo colors are a lot different to the colors that are actually there. Where a light and a dark area join is usually the trickiest part of a painting and usually requires a lot of work. Now just a little dot for the fishing boat that was down there, and it’s reflection…and a hint of sand…a few other finishing touches… and there you have it. And here’s a finished painting I did of the same scene. Well,that’s it fortoday.Thankyou for taking part in my lesson…and remember,practice does make perfect.There are more lessons available online on my website www.newzealandartist.com .Thanks. Learn how to Paint Realistic Water in your Next Landscape !